The Hundred Islands, well exactly, 124 at low tide and 123 at high tide, are all over Lingayen Gulf; they cover a vast area of 16.76 square kilometers. Notably though only 3 of these islands have been developed for tourism: Governor’s Island, Quezon Island, and Children’s Island. History shows that these islands formerly were the seabed of an ancient sea; and that due to the lowering of the sea level, they appeared towards the surface. 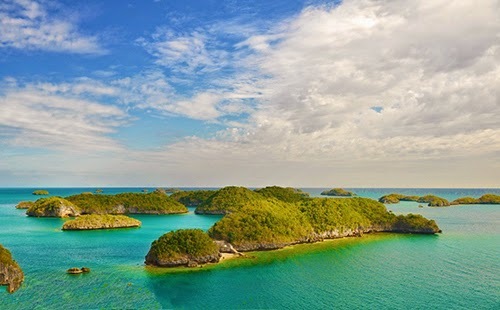 The Hundred Islands National Park is located in Alaminos City, in Pangasinan, Luzon, Philippines. You can go there either by plane or bus/private vehicle. Fly in from all major cities in the Philippines, including Manila and Clark. Otherwise, you can drive for 5 hours from Manila, or take a bus that’s going to Pangasinan from Cubao (Try Victory Liner Bus), and then get off at Alaminos, take a tricycle from Lucap Terminal, then get off at Lucap Wharf. The fun things to do there are: checking out the secret lagoon in Shell Beach, Camantiles Island; island hopping; having seafood; visiting the caves; kayaking; shopping for souvenirs; bird watching; having a picnic; swimming and snorkeling. You can avail their delicious Alaminos Longganisa, Chicken Barbeque, hotel accommodations, souvenir T shirts, etc. Transient accommodations are available at Php 300 – Php 400 (about $10 USD) per person; hotel accommodations at Php 1000 – Php 2500/room (about $20-$40 USD); family room accommodations at Php 3000 – Php 5000 / room (about $60 to $80 USD); PBB House accommodations at the Governor’s Island at Php 10000/night (about $220 USD), good for 10-15 people. Watch out for the biting Giant clams, which are also known as taklobo, an endangered species that were planted in this conservation area. *Its having an island called Marcos Island, which was named after ex-Philippine president, the late Ferdinand Marcos. *There is also a cave there called Imelda, named after the former Philippine First Lady, Imelda Marcos, the widow of the former. *Cabarruyan Island, located northwest of the National Park is the largest island there – thus dubbed as the “mother island”. Here are some excellent accommodation locations near the Hundred Islands: Puerto Del Sol Beach Resort and Hotel Club; Sun Seekers Villa; Awesome Hotel San Juan; Lyn’s Do Drop Inn Transient House; and City Center Hotel. It is believed that the Hundred Islands are about two million years old. Whoa! Moreover, the national park was created by Presidential Proclamation No. 667, under the regime of President Manuel L. Quezon on January 18, 1940.